"TKB-6900 Series Low Band Base Stations are built around the TK-690 high performance 110W radio. 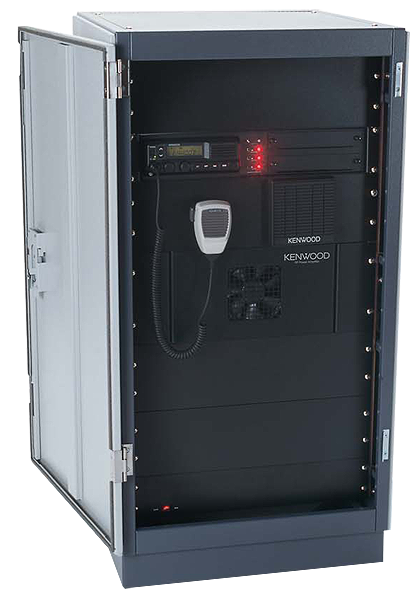 The TK-690 transceiver is mounted in a 2 RU enclosure which includes forced air cooling and option bays for two peripheral circuit boards. The basic configuration includes a 2 channel tone termination panel (2 or 4 wire audio). 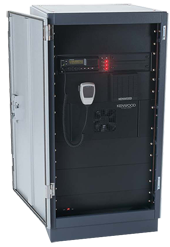 Equipment may be mounted in a cabinet enclosure or open rack, and may be used either by itself (50W continuous duty or 110W at 20% duty cycle) or as a driver for an external continuous duty RF amplifier (100W or 300W). Power supply options include battery backup with integrated SmartCharger and Low Voltage Disconnect. Mounting options include 20 RU (42"") and 40 RU (77"") locking cabinets in addition to 17 RU (3') and 45 RU (7') open equipment racks. External connections are RJ-11 for phone line, DB-25 for access to the internal chassis bus, & type N-female for RF. T-R simplex antenna switching is included in the basic unit as well as in all external amplifiers.